Please refer to our stock # FenPOJaqVLrg when inquiring. 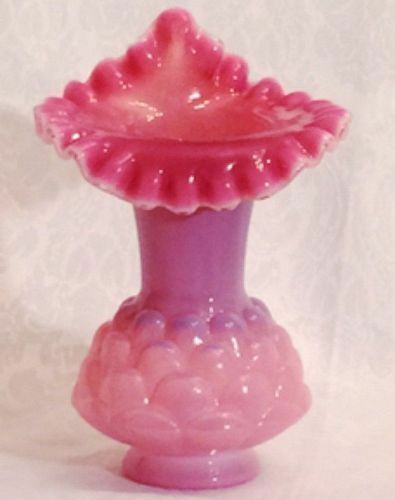 Fenton first created Plum Opalescent from 1959 to 1961 (three years) and produced only a total of 19 items. This hard to find tall (7.5") Jacqueline vase is in mint condition. Originally the pattern was called Avocado, but after the assassination of President Kennedy, it was renamed "Jacqueline" after Jackie Kennedy.